After finally finishing my stuff for the wedding, I wanted something fast and easy before I got going on the projects for my sister. Having only 2 pattern pieces, McCall’s pattern 6078 fit the bill. 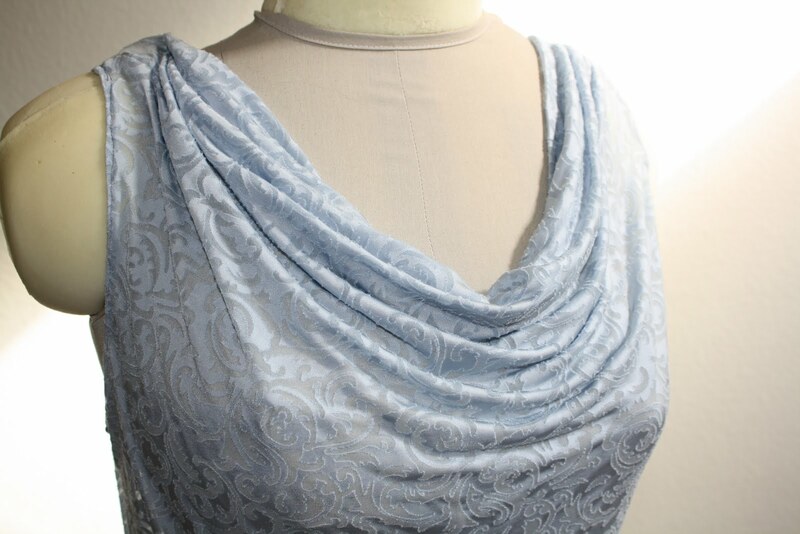 I have this wonderful soft drapey blue knit that I really want to make into a top, however, I love it so much I don’t want to use it on an experiment. I wasn’t too sure how good this cowl neck would look on me, and everyone at the Pattern Review said this top runs big. So I thought I would use some of my recent JoAnn stash accumulations for experimental purposes. One experiment turned out not so good. The other turned out fairly nice, although maybe not my personal favorite style for me. Ok, Pattern Review people – you are totally right! This pattern is HUGE! Based on the envelop sizes, I should be a medium. However, for experiment 1 I cut a small bottom/medium top view B based on the measurements printed on the pattern pieces. Urg. The top is waaaaaay huge. For experiment 2 I cut a small everywhere of view A, and it fits pretty nice, although I think it might have a tendency to fall off of the shoulders, due to the open-ness of the back. I think if I go back and make views B or C, I would need to make a small all over, possibly with a slight FBA to maintain the drape. My dressform has slightly lower bust than I do, so the cowl hangs REALLY low on me. See how big the armhole is? And the neck is HUGE and gaping in the back. View A back – very low and open. I like where the drapiness hits my waist though. 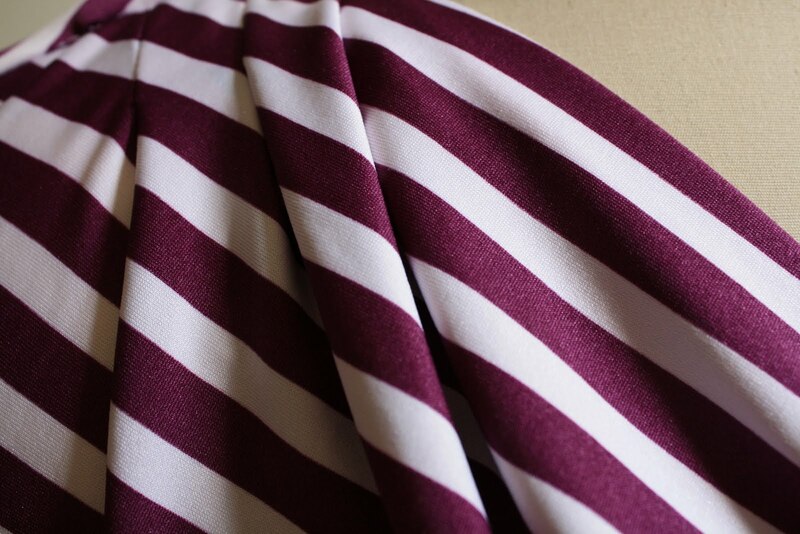 Also, my stripes matched up on the pleating! Matched on the backside too! Pattern Description: Top A with front/back pleats and drape, top B with front pleats and drape, top C with front drape and contrast loops. Pattern Sizing: (XS-S-M) and (L-XL). 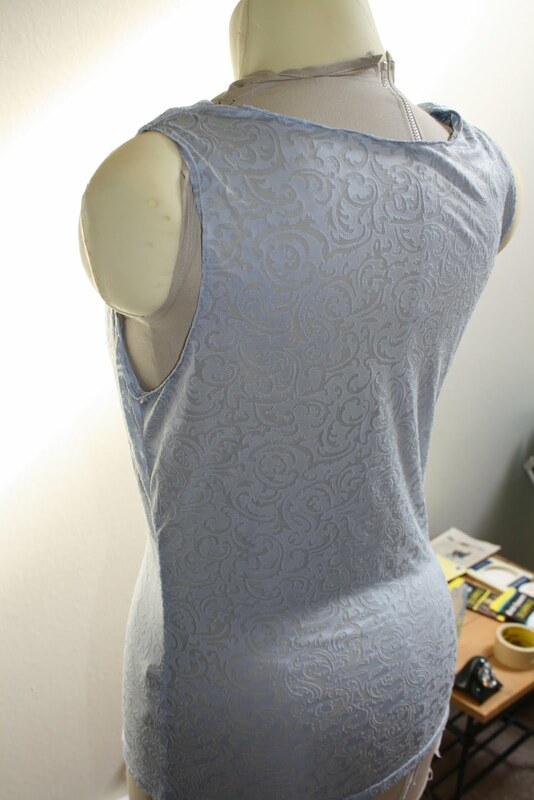 I made view B with a medium top/small bottom (based on the sizes printed on the pattern sheets), but it was too big. I then made view A in a small and it turned out pretty good. I know everyone says it, but it is true – this pattern runs really big! Usually I am a size 12 with FBA up top, which should correspond to medium in this pattern, but even when I made a size small, I had room to spare. Were the instructions easy to follow? Heck yes! I think there were maybe ten steps for view A and seven for view B. I am not a fast sewer, and I don’t have a serger (yet) but it only took me about three hours to make the top, including cutting the fabric. I think this would be a great project for a beginner – enough detail to not be boring, but really simple to actually make. Did it look like the photo/drawing on the envelop once you were done with it? Yup! 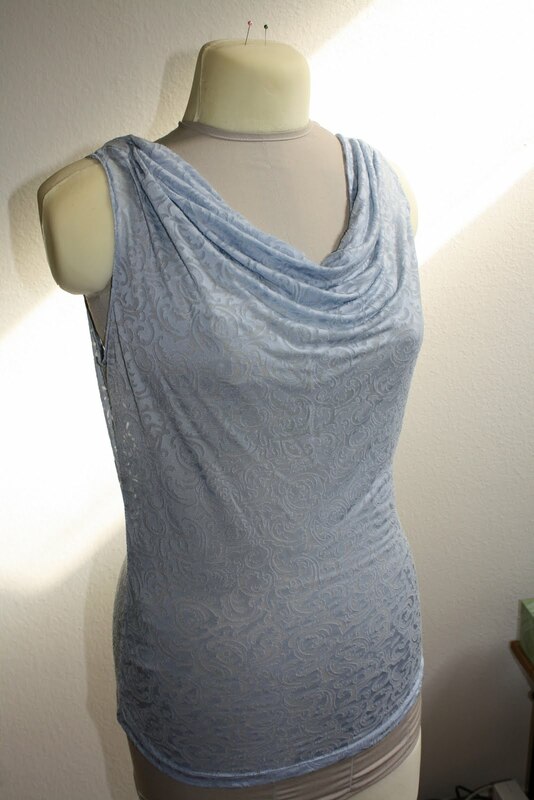 Even though my view B did not turn out well, it still had a nice drape to the front, it was just too big. My view A looked pretty much exactly like the envelop. What did you particularly like or dislike about the pattern? I like that it is actually pretty fast and easy to make. I like that it looks a lot like the envelope pictures. 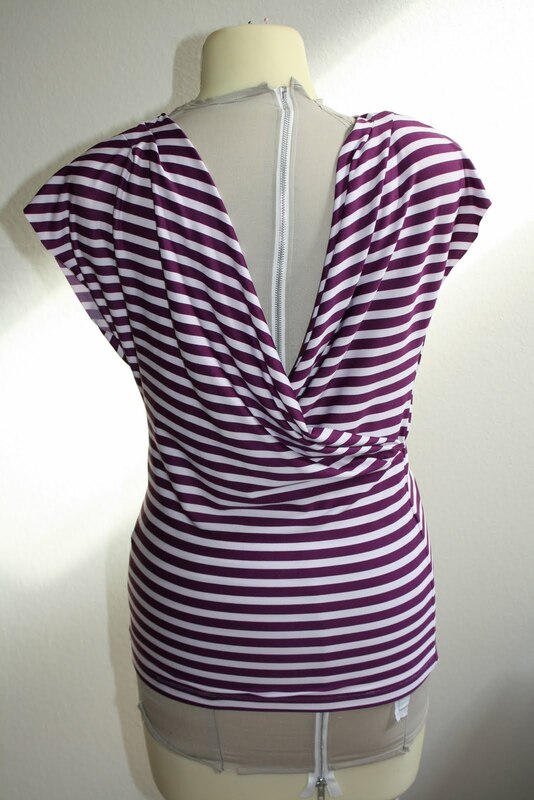 I like how the drape is self-facing and gives a neat edge on the top. I did not like how exaggerated the ease is – ridiculously huge for a knit pattern, especially where the back is mostly open anyway. I like the fit of view A, but the back is a bit low, so, not appropriate for all occasions. The open-ness of the back also means that the shirt is a bit prone to falling off at the shoulders. I also think I need to make the sleeves a tiny bit longer. View B – I need to try this again in a small, but I do like that the back is covered and this could be a more everyday sort of shirt. On the other hand, I don’t know that this is the most flattering style for me, but I wanted to try something different. Fabric used: Polyester knit from JoAnn. Since this was an “experiment” pattern, I didn’t want to use my nice stuff yet, but I am actually fairly pleased with the results. 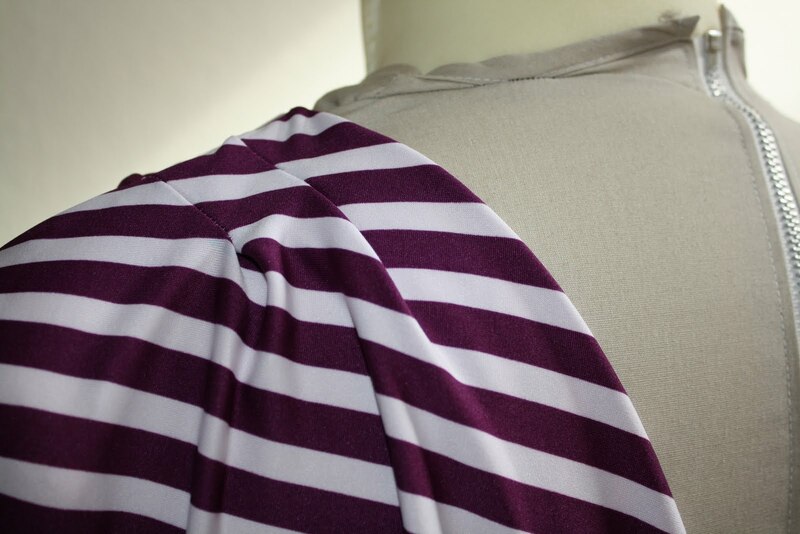 Pattern alterations or any design changes you made: I added +2″ length to the bottom of the shirt. For view A I didn’t finish the hems on the sleeves – I liked the length, and the knit is super stable, so I left them. I think next time I would add a slight bit of length to the sleeves and finish them properly. Would you sew it again? Would you recommend it to others? Yes, I think I might make this again eventually. I would like to make view A in black for a really classy top that would look good with some nice jeans. I want to try view B again in a size small, just to make it fit. I would definitely recommend this pattern. It is very well drafted, goes together super fast, and would be a great project for a beginner. Conclusion: This is a good pattern. I don’t think it will ever be one of my favorite patterns, but I do like it a lot, it is well drafted, and it is fast to make. I think it would be good for a beginner, but if you decide to make it, go down one size from what you think you should be – it will save a lot of fitting problems! So, yeah. I like this pattern, but I am not in love with this pattern. Maybe it is the stripes I used? I think it would look super cute with a thick belt and skinny jeans. I, however, look horrid in skinny jeans. And I need to wear a belt with my pants just to keep them on, so wearing a belt over the shirt would look dumb if I am wearing one under the shirt. I really like my shirt on the dressform, but I don’t like it as much on me. I think it needs proper styling, which, as a jeans and t-shirt person, I am sort of inept at. It is something I shall have to ponder. 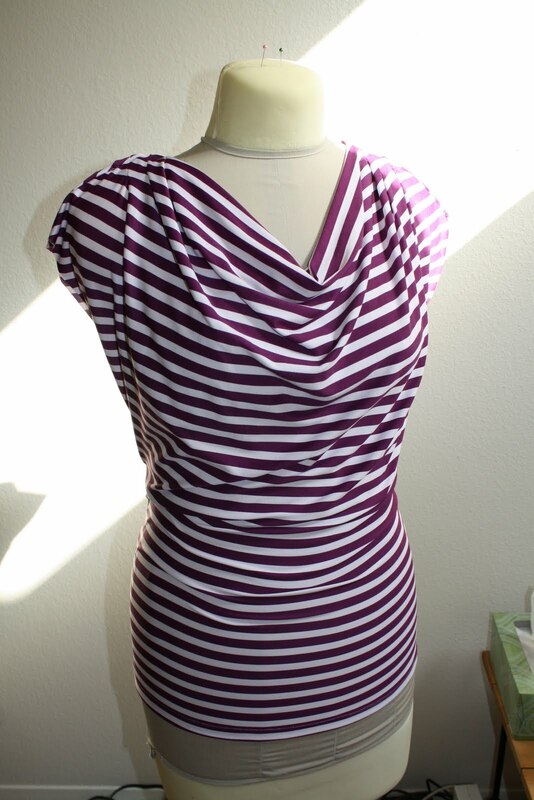 In any case, I am super pleased with my construction at the least – stripes match (even at the pleats!) and I used french seams for the sides. So in terms of construction this was a total win, even if it isn’t going to be a staple of my everyday wardrobe. Both tops look great, I hate they're a bit big tho. I too have this pattern and did not know it run large. Great review! Luckily all is not lost – the blue shirt ended up fitting my sister a lot better than it fit me, so she is going to wear it with a tank under and it looks pretty cute on her. Love, love your tops. I will certainly revisit this top.